When reading through the book Scientific Perspectives on Pseudoscience and the Paranormal by Timothy J. Lawson, I was intrigued early on by the discussion of trepanation. 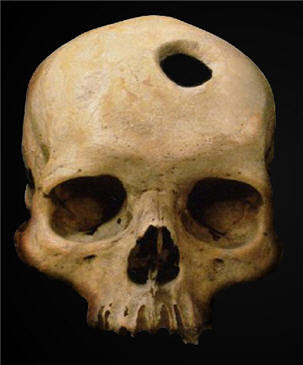 By definition, trepanning is “a medical intervention in which a hole is drilled or scraped into the human skull, exposing the dura mater in order to treat health problems related to intracranial diseases”. Trepanning used to be thought to release demons from the mind, but is also used medically today for legitimate reasons like relieving pressure in the brain. Since around the 1970’s, people began to think that making a whole in the head, also known as a burr hole, can be used simply to increase the blood brain volume. This is where the idea to drill holes electively in one’s own head to relieve symptoms of depression and to improve energy came about. People believe that trepanation and the release of pressure will allow them to be in a child-like state again. The theory is that children have a higher state of consciousness and their skulls are not completely closed, so one can regain this state if they relieve the pressure in their brain with a hole. 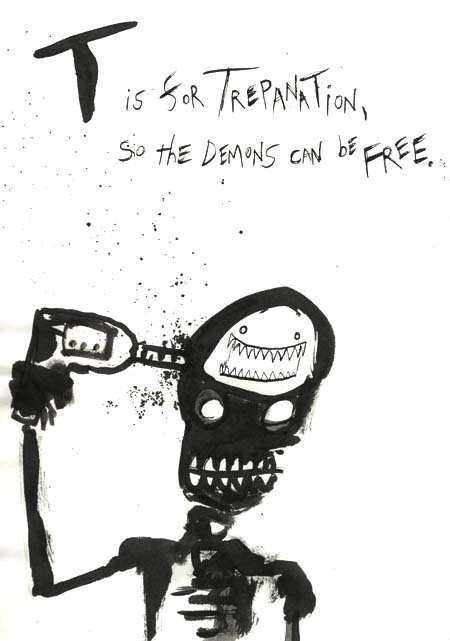 In the book they mentioned the website promoting trepanation, www.trepan.com, which I was very eager to look at. Since trepanation was mentioned in the book under examples of pseudoscience we know this is a good illustration, but I want to go a little further into it. The International Trepanation Advocacy Group website stated that the volunteers of a study who received holes in their head were all satisfied with the results, except they noted that “the data that we were able to collect regarding the scientifically verifiable changes produced by making a skull opening was inconclusive. The MRI methods used were not sufficient to show any changes in blood flow and we discontinued the pilot study until such a time that the methods of observing any changes produced could be improved”. This was my first “pseudoscience red flag”. I think that it was convenient that they could mention the patients were satisfied with their trepanation, but the actual scientific results were inconclusive. This is a good example of emphasis on confirmation rather than refutation like mentioned in the book. I also found it very interesting that the websites founder and senior director is Peter Halvorson, whose claim to fame is a successful self-trepanation some thirty odd years ago. This is an instance of overreliance on testimonials and personal experience. Who is to say that for some other reason Peter’s new outlook on life didn’t come from any number of other reasons, o r that the mere idea of the surgery, like a placebo, cured his depression? This is why scientific data is very important, why there needs to be control groups and not just patients receiving the treatment. This was another downfall to their attempt at sound evidence, they tested fifteen patients who all received burr holes in their head. They have no one to compare this too, no control group that provides them with proof to say that the holes actually led them to be satisfied. There certainly is a lot of information out there to lead people to believe that this is the truth, but none of it is actual scientific fact. I also found trepanation to be on Discovery.com’s “Top 10 Cures That Didn’t Work”. Trepanation came in at number three and was beat out by radium water and exorcism, so I definitely think they would be interesting topics to look into further. I recently read/saw something on trepanation.. It's escaping me right now (If I figure it out before I head to bed tonight, I'll post it.) Very interesting! Thanks for the blog about it! I find it amazing that even today people are willing to alter their cranial structure for cosmetic reasons. What if they are in a car accident and the exposed portion of the brain sustains injury. Is the probability that the injury could be irreversible? What's so special about Mozart? The truth behind human energy fields. Friday the 13th: Unlucky or Unreal? Are our lives really planned out? 7 years to digest a piece of gum? Did extraterrestrial life really visit earth? Can music really raise our IQ? Who is talking about me? Broken mirror: 7 years of bad luck?? Dont believe everything through the lense. The Courage to Heal? or The Courage to Blame? Is it okay to honk your horn while in a tunnel?